Going for a hike, are we? You’ve got your boots, your backpack, your pants, your tent, your food, your water, your camera and everything else. But have you also thought about taking a first aid kit with you? Hiking is fun, but not if you have to walk around with a superficial, yet painful scratch on your skin. A scratch you managed to get in the first hour of your hike, no less! Be smart. Be prepared. Bring a first aid kit and don’t let minor injuries ruin your beautiful days on the trail. This ultralight hiking medkit can give you the peace of mind that you deserve, when you are hiking or camping. It is now unique and upgraded from the previous kit. Stronger, bigger metal tweezers and scissors, a highly accurate compass and several other useful items. It is lightweight, efficient and durable, which means that you will not have to encounter those cheap, damaged or flimsy hard cases. The bag is flexible, versatile and compact. It takes very small space inside your hiking bag or car. Additionally, it is designed in a way that you can carry it suspended, without weighing you down. In fact, you don’t feel like you are carrying it, until you need it. With this kit, you are always prepared when disasters strike. As a hiker, you don’t know the type of emergencies that you can encounter out there. That is why you need a medkit like this one. It is the perfect blend of emergency preparedness items and medkits. Since it is lightweight and durable, it is the preferable option for hikers and backpackers. The kit is also spacious enough, in case you want to add your own supplies. Featuring some of the highest design standards, this medkit for a hiking trip comes with premium medical supplies and essentials for survival and emergency situations. It is designed with your safety in mind. Being FDA-approved, you are getting a first aid kit containing enhanced survival and medical supplies, for beginners and advanced hikers as well as avid outdoorsmen. It provides convenient and comprehensive care. Everything needed for cleaning and dressing up wounds and infections is contained in this convenient pouch. It is your ultimate first aid survival kit. Its premium range of medical supplies and small equipment gives you that peace of mind. For maximum portability and efficiency, this camping medkit features a travel-friendly compact design. There are no warnings for emergencies when you are hiking. They can spoil your whole trip, if you are not adequately prepared. Therefore, this kit was designed just for you. Everything inside the kit is organized and neat. Moreover, the carry bag is constructed with sturdy nylon, for that durability. The bag is flexible and compact, making it easy to carry with you. If you are searching for a waterproof first aid hiking kit for your next trip, this one should be your main consideration. It allows you to deliver effective and emergency medical care especially for outdoor trips. With dual-stage waterproofing, the bag features outer seam-sealed silicon nylon bags as well as inner DryFlex bags together with a water-resistant zipper, which keeps your first aid items dry and safe. It is compact and easy to carry. You can easily stash it inside your backpack, and you will not experience any noticeable change in weight. It can provide first aid supplies to a group of four people, for around 6 days. Some of the contents include bleeding and wound care, sterile bandage materials, fracture or sprain care, blister or burn care, common tools, and other essential supplies, all contained in this waterproof bag. The good news is that the whole kit does not come with an expiration date. What you will just need to change are the medications after a year or so. If you don’t have any medical training, these medical supplies will provide emergency relief when you are hiking or camping, until you access advanced treatment. Weight is a major factor when it comes to hiking or backpacking trips. However, this survival kit weighs almost close to nothing. This Northbound kit is designed to provide reliable and dependable protection needed, when you are out there in the wilderness. It can treat up to four people. Apart from that, it features high performance medical essentials, which are well protected from weather elements by the laminate waterproof packaging. This kit is MOLLE compatible and TSA compliant. This means that you can attach it to your belt or backpack. Additionally, it is spacious enough, to allow addition of other supplies. It is lightweight and compact, which makes it easy to carry it with you, whenever you go hiking or trekking. It is lightweight yet rugged enough to handle the tough trail conditions. It is durable, versatile and reliable, not like one of those flimsy packs that break down fast. The zipper is highly rated to perform thousands of closures, without getting spoilt. There are plenty of pockets on the outside bag to ensure that the contents are organized. The bag also opens flat. This allows you to see all the contents without removing everything. Be prepared for all the emergencies you might encounter when hiking, with this first aid kit. With more than 299 essential medical pieces, you are ready to handle those bruises, burns, sprains or cuts comfortably. This kit allows you to attend to those minor injuries, keeping them in control, without disrupting your hiking. Supplies in the kit include bandages, cold compress, first aid guide, vinyl gloves, trauma pad, first aid tape roll, cotton tipped applicators, antiseptics and a host of others. All the supplies included in the kit are physician recommended. If the expiration date of the medication nears, just replace them with fresh ones from a drug store. It is primarily focused on bandages, since you are likely going to use them most when you are hiking, as compared to other supplies. The supplies are contained in a double-zippered, soft case, which is also waterproof. It is designed in a way that you can easily carry it whether inside your bag or just suspended. From attending to bug bites to providing diarrhea relief, this kit comes 100 pieces of essential supplies, to minimize incidences during your hike. The pieces are contained in a water-resistant soft bag, which is designed to last for long, regardless of the conditions. You don’t have to carry those heavy and bulky first aid kits anymore, thanks to the Always Prepared First Aid Medical Kit. Being so lightweight and small, you can perfectly stash it inside your backpack, without adding excess weight. With 100 pieces of essential supplies, you are more than prepared to handle whatever that comes your way. Apart from the medical supplies, you will also find special items like poncho, compass, CPR mask, Mylar blanket, sewing kit, and whistle among others. As much as it appears small and compact, you will still find sufficient room inside, to carry your allergy medication, aspirin and other necessities that you carry when hiking, but not included in the pack. Although the products inside might not be premium, they will prove to be very reliable, when faced by an emergency. The quality is sufficient to handle a wide range of minor injuries, without breaking the bank. Perfect for camping and hiking, this first aid survival kit comes with all the essential items and supplies needed to attend to minor injuries and aches. Supplies are perfectly arranged in the inner clear pockets, making it easy to find them. Contents include accident report form, first aid guide, vinyl gloves, ointment, sunblock, blister prevention, assorted bandages, sting relief pads, antiseptics, ointments, and burn relief products among others. Whether it is a cut, scrape, sprain or insect sting, everything is covered in this first aid equipment for hiking. The items included are of good quality, designed to make sure that they can last you the entire time when you are out there hiking. Ensure that you check the expiration dates, especially for the medical supplies like drugs. You can also add your own items inside there, since the bag has enough interior space. It is a lightweight kit that is easy to carry around. If you are actively involved in sports or other outdoor activities that might expose your body to minor injuries and aches, then you should have this kit close to you. 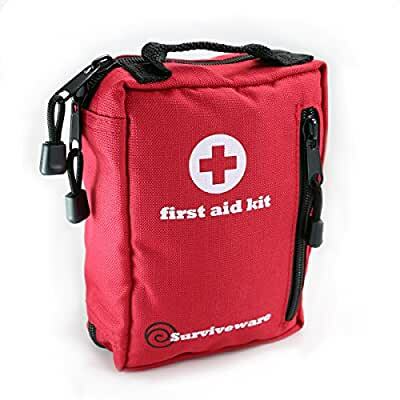 Durable, compact and lightweight is what you get when you buy this first aid kit. Designed for hikers, campers and backpackers, it comes with some of the most important supplies needed out there. The bag itself is crafted using 600D polyester, which is one of the strongest and most durable materials. With large stainless steel scissors, you can cut through almost any type of seatbelt or clothing with ease. You don’t have to worry about those weak and flimsy containers that break down even before you hit the trails. This bag is designed for longevity, while keeping the supplies protected. It is compact, portable and light. It is fitted with 100 vital lifesaving supplies and only weighs 1 pound. Featuring MOLLE compatible straps, you can easily wear it on your belt or even on your backpack if you prefer. Take it for your hiking and backpacking trips, and be ready to tackle those unforeseen emergencies. The bag is water resistant while the waterproof inner laminate protects all supplies against moisture. For easy access of the items, every inner sleeve is appropriately labeled based on its functions. This means that you can easily retrieve and replace them. It also comes with a separate zip pouch that can be used to carry your own supplies. Whether you are on a fishing trip or you are trekking through the woods, accidents can happen anywhere. You can strike your foot against a rock or slip and fall. Whichever the case, it’s always important to be prepared for the worst, and this is where the Be Smart Get Prepared 270-Piece first aid kit comes in. This portable first aid kit for expeditions can mean the difference between life and death. It comes with numerous medical supplies, which you can use to mitigate the effects of an injury before you can seek professional medical help. This first aid kit meets the FDA regulatory standards, which means that you can use all its components with confidence. Therefore, the kit is of high quality. Also, all the components inside are organized in a manner that is easy to access and use. Furthermore, they are safe. Some of the medical components that you will find inside include 15 antiseptic wipes, a first aid guide, tweezer, nitrile gloves, burn cream, sting relief pads, painkillers, gauze pads, adhesive tapes as well as antibiotic treatments, among others. As you can see, it comes packed with most of the medical supplies that you will need when you are out there, whether you are hiking, fishing, backpacking or camping. All the supplies are locked inside a medical ammo can, which meets the specifications of the U.S Department of Defense. The can comes with an easy to carry handle, as well as ample interior space if you want to add your own supplies. Apart from that, the can is airtight, which ensures that your supplies remain in good condition at all times. If you are looking for a military-grade first aid kit that comes with all the supplies that you would need when you are indoors or outdoors then you should check out the VooDoo Tactical Universal Medic Bag. Thanks to its spacious design, you can carry as many first aid supplies as you want. For instance, you can store the scissors, tweezers, safety pins and finger splints in the first compartment and then store alcohol wipes, sunscreen, gloves, razor blades and tape in the 2nd compartment. The third compartment is bigger than the others, which means it can comfortably accommodate items such as a headlight, chem lights, an emergency blanket or a razor knife, among others. The bag itself is made of durable and waterproof materials. Therefore, it will serve you for many years. You just need to be replacing the supplies whenever they run out or expire. The material is rugged and tough, designed to protect your medical supplies from harsh weather conditions. This first aid kit for a fishing boat comes with 3 fold-out compartments, with each of the compartments having a zippered closure. Also, the bag folds compact and tight, and the flap is then secured in place by a quick-release military buckle. With this medical bag, you are assured that everything inside will be safe and secure, whether you are ascending a mountain or backpacking with your bike. It also comes with MOLLE compatible fittings, meaning you can wear it on a pack, vest or belt. This 2 in 1 premium first aid kit has more than 120 medical grade essentials in a flexible, compact and durable design. Weighing around 1.2 pounds, you can travel with it wherever hiking takes you. No emergency will be too big for you, as long as you have this kit with you. Crafted using the highest quality safety standards, this FDA approved kit contains medical grade supplies, that can even be used in clinics and hospitals. A 32-piece mini medkit is also included. This lightweight and amazingly small pouch includes sting relief pads, bandages, gauze and others. It can fit perfectly in your lightweight daypack or even a pocket. The kit is multipurpose. Apart from hiking and camping, you can also use it at home or even inside your car. It is a very durable and compact kit. The supplies are neatly arranged inside, so that you can easily access what you need. There is additional space to include your own supplies such as prescription drugs. As much as the pack is not waterproof, it is compact enough to fit inside a ziplock bag, thus keeping everything protected from moisture. Your health should always be a priority, whether you are relaxing at home or hiking. With this medkit, you will always be able to attend to minor health issues like bruises, strains, and aches. It prepares you to handle disasters and emergencies. Weighing only 10 ounces, this medkit for hiking trips is lightweight, allowing easy movement from one place to the other. It is also compact, easily fitting into your daypack or backpack, without displacing other essential hiking gear. It can also fit on your belt, for easy access. The kit is crafted using high quality standards in FDA approved facilities. Therefore, you are guaranteed that the essential supplies in this kit are healthy for use. It is easy to find, thanks to the red color of the bag. Additionally, the items inside the bag are logically arranged, making it easy to find any item. Items have been upgraded from the previous versions. For example, you will find stronger, bigger metal tweezers, scissors and others. For enhanced safety, a compass and a safety whistle have been added. With this medkit, you will be prepared to handle any form of emergency or disaster that you may encounter during your hike. Featuring an assortment of 100 emergency supplies, this compact kit is definitely a must-have, whether you are an indoors or an outdoors person. This first aid kit for fishing boats meets ANSI and OSHA guidelines. All the components inside are of good quality, and the case itself is made of durable and sturdy plastic. It comes with numerous interior shelves, which make it easy to organize your supplies. Some of the emergency supplies that you will find in this kit include antiseptic towels, alcohol wipes, antibiotic ointment packets, adhesive bandages, adhesive tapes, and examination gloves. It also features a first aid guide. Whether you are backpacking through Europe or camping in a local park, this first aid kit for backpacking comes with all the necessary supplies that you will need whenever you are out there. Furthermore, the supplies are organized in a way that is easy to access. Also, the supplies are versatile enough to deal with various emergency situations that you would come across whenever you are out in the woods. From cleaning wounds to pain relief, this kit comes with almost everything you would need to attend to non-life threatening injuries. The Be Smart Get Prepared 100 Piece First Aid Kit is highly recommended for home use, office use or outdoor adventures. If you are looking for a compact and portable first aid kit that comes with a wide range of emergency supplies, then you should check out this one. From home, office, camping or backpacking, this first aid kit is versatile enough for different applications. The interior compartments are well organized, making it easy and fast to access your emergency supplies whenever the need arises. Refilling your supplies is equally easy. The emergency supplies that come with this kit include antibiotic treatments, burn creams, sting relief pads, butterfly closure bandages, finger splints, and examination gloves, just to name a few. All the supplies are stored in a sturdy and durable case. Also, the case is easy to carry, portable and most importantly, it will protect everything inside. Whether it’s snowing or raining, the sturdy case will ensure that your supplies remain in great condition at all times. Furthermore, the case is impact resistant, which means that if you trip and fall, your supplies will not be affected. This portable first-aid kit for a day hike is lightweight and compact. It will not add any weight to your backpack. It meets ANSI and OSHA regulations, making it perfect for home or outdoor use. If you are looking for a portable first aid kit that you can keep in your fishing boat, car, house or lifeboat, then this is a perfect choice. This first aid kit for camping comes with 150 pieces of emergency supplies. It features a vast selection of vital medical supplies, which you will you will need during an emergency. Some of the supplies that you will find in this pack include adhesive bandages and dressings, which will come in handy whenever you are stanching a wound as well as an emergency whistle that can attract rescue personnel to your location. It also comes with gauze pads that you can use to cover a wound or stop bleeding, as well as some butterfly closure bandages for dealing with small injuries like blisters, scrapes, and cuts. All the supplies are stored inside a durable and compact case. Also, the case is highly portable, making this first aid kit perfect for anyone on the move. It can fit anywhere in your office desk, backpack, closet, closet or in your car’s glove box. This first aid kit for bleeding comes with a well-organized interior. Therefore, you will have easy, quick and convenient access to any item that you want to use. It also features ample interior space, which you can use if you want to store additional components such as personal medications or other vital necessities. The entire kit is lightweight and easy to carry. A carabineer has also been included for easy attachment to your rucksack or belt. As long as you have this first aid kit with you, you are prepared for most of the emergencies that you might come across. A first aid kit is no longer an option, when it comes to hiking. It is a necessity since you don’t know the type of emergency that you might encounter out there. As much as no one would want to get hurt, it is always advisable to be prepared instead of finding yourself in an emergency and you don’t have the right tools. If you are heading to the backcountry, pack the kit early enough. Chances are very high that you will need first aid in the course of your hike. However, your medical supplies will only be useful, if you know how to properly use them. Therefore, educating yourself on first aid care basics is equally important. There are many available options, when it comes to choosing the appropriate medkit for your hike. There are pre-made first aid kits that you can purchase, based on the length of the trip and your intended activity. The kit you take for your daypacking trip is not the same as the one you take when going for a 3-week remote country trip. If you don’t feel like the supplies provided in the pre-made kits will not be sufficient for your trip or type of activity, then you can always put together your own kit. Portable medkits are available in different types and sizes. When buying one, you should consider group size, trip distance or length, trip activity, as trip risks and special needs. They can also be classified into day use models, overnight use models and expedition models. For the day use first aid kit, you will need the following items. For the bandage materials, your kit should have at least 25 bandages in different sizes. Some of them are pre-packaged in the kits. Others can be obtained at the local pharmacy. Gauze pads are also required in different sizes. These cotton-made pads are mainly used for dressing wounds and injuries. They are usually preferred because they don’t stick to the wound. Purchase several for your day use kit. Another item would be non-stick sterile pads. They are used directly on the affected area for providing protection and cushioning. They also absorb any seepage from the wound. Surgical or medical gloves will work perfectly in this situation. Avoid latex gloves as much as possible and use nitrile gloves instead. Blisters and burns are common occurrences during hikes. Therefore, you kit should have appropriate items to handle such. For the CPR, go for a breathing barrier fitted with a one-way valve. This protects the rescuer from transfer of any infections. Fine point tweezers will be sufficient for handling splinters or even other pointy objects like cactus thorns or needles. You might also consider safety pins. Pain relief medication is an absolute necessity, such as ibuprofen and acetaminophen. These are very effective in reducing pain. If you will be going for a day hike, two single-use packets will be enough. You can also encounter allergic reactions in the bush. Therefore, ensure that antihistamines such as diphenhydramine are included in your first aid kit. Insect stings are common that’s why you need a medicating relief like Sting Eze pen. If you are going for a longer backpacking trip, then you will need to take good care of your wounds. Have some antiseptic towelletes for disinfecting and cleaning the wounds. Wipes with benzalkonium chloride base are most preferred. For protection against cuts, scrapes and burns, ensure you have antibacterial ointment in your kit. Compound tincture of benzoin is one of the most commonly used solutions on the skin, before the application of bandages. Butterfly bandages are very effective in closing deep cuts. You will also require some waterproof medical adhesive tape to keep bandages in place. Well, you don’t know what you might encounter during your day trip. That is why you need items such as a whistle, a bottle of sunscreen, a waterproof bag, some toilet paper and an extra flashlight or headlamp. If you intend to stay for more than a day, then you will definitely have to be self-sufficient. You will be further from the trail-head, which means accessing emergency medical care will not easy. Due to this, you will need an overnight kit, which will has more supplies than the one for day use. Apart from the day use supplies, here are more items that you should carry. For your overnight trip, you will need rolled gauze, stretch to conform rolled bandages, as well as liquid bandages. Liquid bandages are preferred because they offer a waterproof, flexible and breathable protective barrier for blisters and small wounds. Gloves will be needed in large quantities as well as homeostatic gauze. It promotes blood clotting, thus preventing excessive bleeding. For the sharp items a medical waste box or bag might be needed. For sun exposure relief, ensure aloe vera gel is in your kit. Hydrogel-based pads will provide cooling relief for burns. It can also be used to absorb seepage from wounds as well as preventing infections on wounds. Fractures can end your hiking prematurely. That is why you need to attend to them immediately. If you can manage to reduce swelling and inflammation, then you can proceed with your hike safely. Make sure you have an elastic wrap for securing bandages and immobilizing joints. Two to three triangular cravat bandages should not miss out too. For immobilizing and supporting fractures, carry some finger splints. An athletic tape is a versatile item for taping injured ankles as well as providing joint stability. As for instruments, what is needed is an irrigation syringe for flushing wounds, steel sewing needle, trauma shears, standard oral thermometer, multi tool or pocket knife, and a surgical razor blade. If you’ve made it so far, then you must really want a first aid kit pretty bad. Should you be interested in creating your own from scratch, then be sure to check out how Tara from Back Road Ramblers does it. She’ll guide you through the whole process complete with pictures and everything!